Step 1: Cook rice according to package directions. Add peas during the last minute of cooking; stir in half of the green onion, and lemon juice. Step 2: Meanwhile, using a sharp knife, score skin side of salmon, slicing 1/2-inch (1 cm) across and about 1/4-inch (5 mm) deep; season all over with salt and pepper. Step 3: In large, heavy-bottom skillet, heat oil over medium-high heat; cook salmon skin side down for about 5 minutes or until skin is golden brown and crispy. 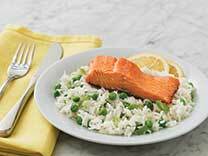 Turn over; cook for 2 or 3 minutes or until fish is just cooked through and flakes easily with a fork. Serve with rice and lemon wedges. Sprinkle with remaining green onion. For simple 1+1+1 meal ideas and inspiration, visit Thirdoftheway.ca or share your #weekdaywin on social media to inspire others. Many Canadians are already a third of the way to dinner when they have easy-to-cook staples ready in the pantry. Think of your meal in three parts: veggie, protein, and grain. Once you have one component, you only need to pick the other two. This recipe from Minute Rice uses just three main ingredients, takes ten minutes to prepare, and can be on the table in just over a half-hour. One plus one plus one and you're done. Now, that's a weekday win.